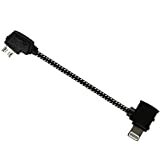 · 9.3cm/3.66 inch long cable for cell phone. 20.7cm/8.14 inch long for Android tablets or iPad. · Please make sure to choose correct connector for Android device. Check our picture to choose Micro-USB connector or Reverse Micro-USB connector. · A must-have item for DJI Mavic Pro Drone to connect your cell phone / tablet.